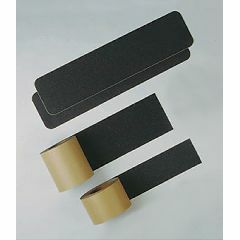 Anti-Slip Adhesive Tape provides excellent nonskid footing in areas where grease, water, and other liquids can create an unsafe environment. Slip-resistant, high traction, and pressure-sensitive, backed strips meet OSHA standards for multiple safety requirements. Prevents slips and falls but it is a bit difficult to keep clean. Overall, I am satisfied. Have not yet had this installed due to winter weather. However, the texture of the product will increase safety of stair surfaces which are painted wood and slippery when wet. Product unit appears generous in size to provide coverage for many steps or areas needing more traction.